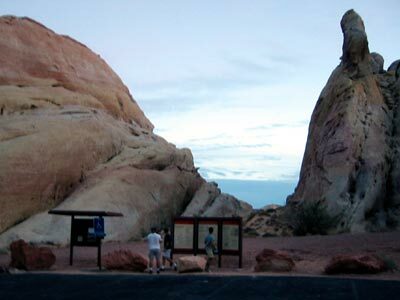 Another 30 minutes of driving to the north and east, and players found themselves in the Valley of Fire. The late afternoon turned to evening, and the sun painted magnificent magic-hour colors across the mars-like rock formations. Towering above our teams on both sides, limestone rock began to blot out the remaining light. A quick examination of the trail-head sign clearly described the site Shelby had intended his searchers to go... "the Narrows". Unfortunately, it's easy to find on the sign but not so easy to find as one sprints 1/2 mile to the outward end of the trail-loop. And even worse, Shelby couldn't leave clue-envelopes at eye-level where they'd be visible to any passer-by either. How do you solve a clue without solving a clue? 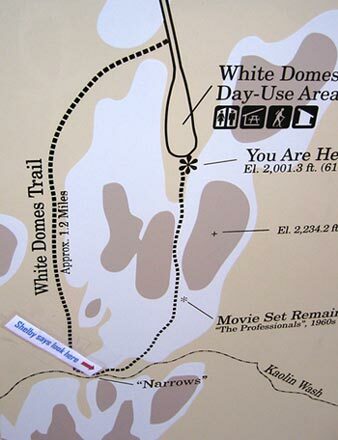 Well, the Yellow team managed to do just that here at White Domes. As soon as they had retrieved the clue from the Narrows, they utilized their satellite phone to call in the A# number (no cel-coverage here!) and were sure to listen carefully to Shelby's A# message. One of those sharp-eared teammates connected the allusion to Charlotte's web with the name of a site they had driven past on the way to White Domes, and thus arrived at the next location before they had completely solved the clue that would get them there. Good things come to those who keep their wits about them. ...and then there are those for whom a rough night camped on a lakebed can dim the otherwise sharp wit. Sadly, the Red team learned just how remote the Valley of Fire State Park area really is... working to catch up to the pack, they left the Lake Mead area without filling up their gas tank, and had to detour to the nearest-- and only-- town within nearly 100 miles in order to get gas. Sadly, that added time to this leg of the Run for them. Fortunately, though, they managed to never actually run out of gas!